All the hoops are now in place and after a final cut of the court tomorrow, evrything is ready for the first day of our season Friday (Bank Holiday). superior imperial maths with the hoop settimg. There was action on all four courts in both morning and afternoon sessions with 'doubeling up' the norm to accomaodte demand. It was especially nice to see Vivian Thomson 'back where he belongs' after a difficult winter health wise. 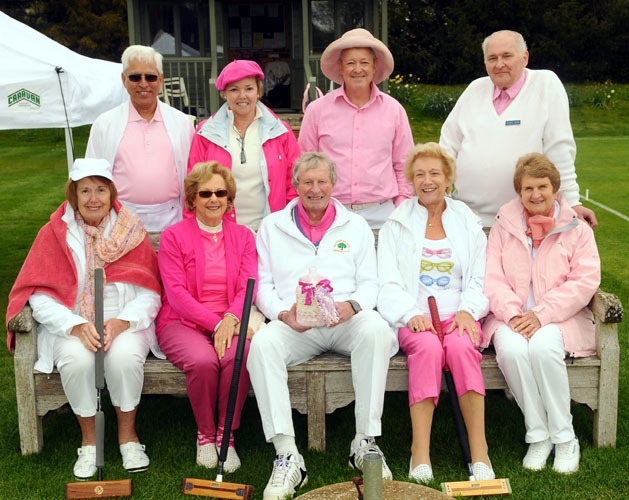 We have recieved a hugh complement from one of the strongest Croquet Federations in the UK with an invitation to join them. now, had only three matches scheduled in the small Southern area league. As 'outsiders' we are expected to play all these games away as a default, so trips to Surbiton, Woking, Cantabury & Ramsgate are likely. 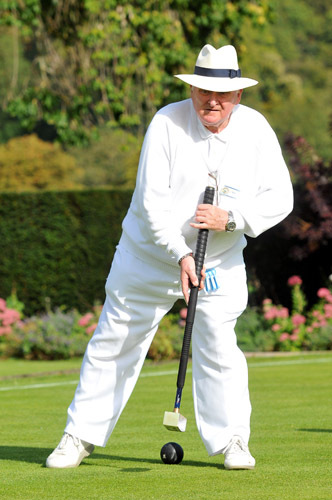 The draw for the Croquet Association's second tier knock-out competition was made this week and sees us drawn to play Hurlingham, most likely away. We were narrowly beaten in the semi-finals last season and so lets hope we can go at least one better this time! - The draw for the first tier 'Inter Club Championship' (in which we were also semi-finalists last season) is yet to be made. 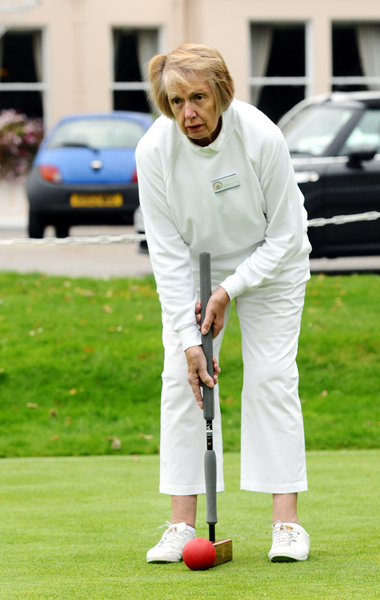 PCC handicapper Vivian Thomson and the Golf Croquet Sub-Committee met today to review palyers handicaps. The vast majority remain unaltered but some players recived reductions to better reflict their skill level. 'Top Man' in this regard was Hugh Crook (pictured right) who was moved from 8 to 7.
unsusal croquet figurine trophey which unfortunatly she had to leave behind in the US. Well done Rosie! Details of this One Day Doubles Tournament, hosted this year by Ryde Croquet Club on the Isle of White, went on display in the pavilion today. If you would like to represent Phyllis Court, please see Frances Colman or Chris Roberts a.s.a.p. 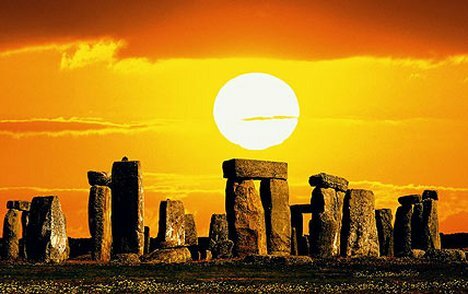 and no later than 23rd April. An attendace of 16 was beyond all expectations at today's first gathering of our AC players and those present were rewarded with a lovely sunny morning. Michael Wiles moved up for last season's 'new AC players group' and new for that band came in Margaret Broughton (pictured right) and Philip Allison, who enjoyed their first lesson under Brain Bucknall's tutorship. Brian is gathering the entries to our AC Competitions and could do with just a tad nmore support numbers wise to make things work easily. 'Phase One' of beginers' training got underway today with 22 new recruits being shown the roaps by our training quintet Helena Fensome, Pam Mead, Frances Colman, John Chalfont and Chris Roberts. Another 11 are waiting in the wings for 'Phase 2' in a couple of weeks time or, in a few cases, join us as players with previous experience. It's congratulations today to Michael Wiles (pictured left) who reduced his handicap at the Hamptworth Club's 'C' Level Tournament today. On the first day, Michael had only missed out winning the whole event by one hoop in the deciding match. 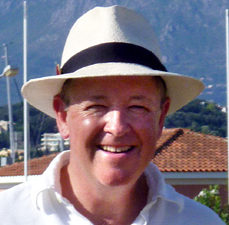 Winning 8 and drawing 2 of his 12 games, Michael collected an impresive 52 index points in the two days to pass the tirigger point that makes him a new 6 handicap. Micheal will still be eligable for our 7+ Competitions however, having got his entry in weeks ago. Heather Masheter (hc 7) and Pauline Wood (hc 9) also competed at Hamptworth this weekend. Our PCC 'A' team will be breaking new ground with a match against new opponents following the draw for the National Inter Club Championship. 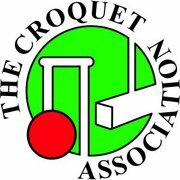 We have been given a first round bye and then the toss for venue will be all importiant when we will be paired with the winners of Bristol based Boardwas, or the Geordies from Tyneside. It's happend already - overnight and morning rain and there is standing water of three of our four lawns. The drainage work undertaken to the Club House and carparks this winter, has clearly not had any effect on us - very disapointing. 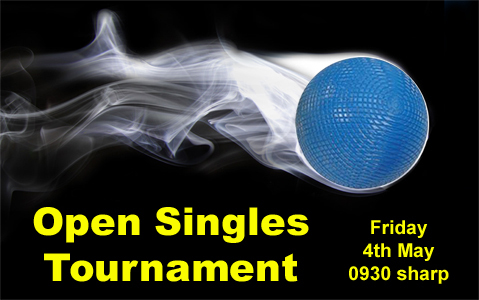 UK Open, at Surbiton this weekend. - Of the 17 players, 14 were had handicaps of '0' or '1'. Both PCC players at least matched their handicaps with Chris (hc 1) winning 4 games from 8 in the block round, and Helena (hc 2) ending 2/8. Both then won again in a somewhat curtailed Plate competition and Chris was honoured to be asked to referee the final. Seasoned AC international James Death beat home favourite Howard Cheyne in the final. 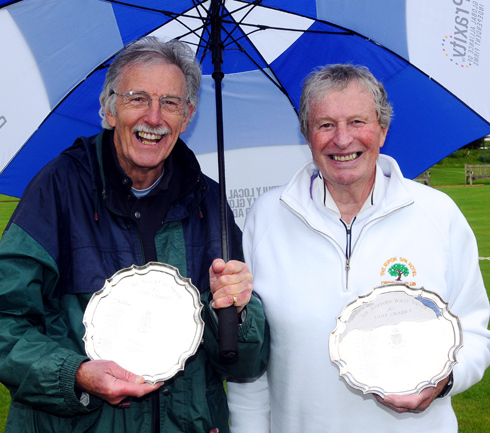 Congratulations to Mike Fensome & John Stanner who won the much postponed 2011 Cave Wolfe (5+ Doubles) Tournament today. 'The Cats', as was their monica for the tournament, emerged as the only undefeated pair after four rounds of rain soaking play. Playing in this 'flexable swiss' format, chosen because of the uncertain weather prospects, they defeated John Chalfont & Don Rutherford, 'The Monkeys' in a defacto final. John C & Don's victories tally saw them tied on three wins with Rosie Richardson & Pat Eades 'The Kangaroos', but the chaps were confirmed in second place, having won the 'head to head' match earlier on. A special thanks to all 14 pairs for sticking at it in the cold and rain - you all made it happen - really well done everyone! 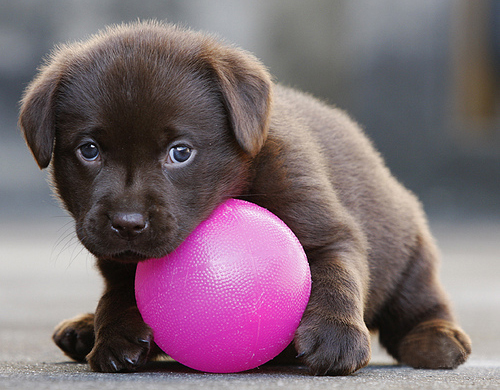 24th April - Mike Fensome wins Charity 'PINK' One Ball, as Raghu Iyer springs surprise! It has been quite a pair of days for Mike Fensome who today added this fun event to his victory crowns. Losing just one game all morning, Mike energed as a clear winner ahead of Heather Masheter and surprise outsider Raghu Iyer. Going into the last round, Raghu who only started playing last season, was in with a shout of victory but he had to hope for slips from both Heather and Mike. But neither faultered and that pushed Raghu narrowly into third place. lead by Michael Wiles, between showers today. Although the final match scoreline read 9 - 3, the detail of eight of the twelve ties ending either 7-6 or 7-5 showed just how tight those games were. The match was tied at two games apiece after the two doubles rounds but PCC 'B' played a decisive hand in the singles winning seven of the 8 ties. The playing schedules for the 2012 Season Long Competitions are on display in The Pavilion. 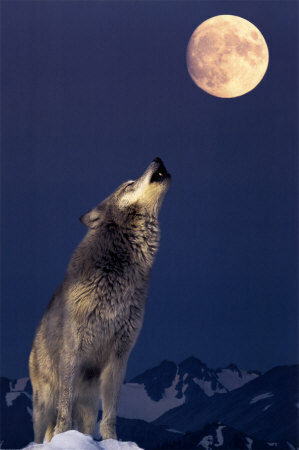 They were distibuted to all members with e-mail today, and will be detailed on this web site shortly. In a day of surprises, steady Mike Fensome made it 3 out of 3 and took home our latest trophy 'The Blue Ball'. Every one lost at least once during an unpredictable day that eventually saw Pam Mead lose out to on form Mike in the final. the US), Margaret Broughton and John Hale - all of whom won at least once. Thanks to Ralph Chambers for supporting the Tournament by pitching up as reserve. and Women's World Champion Rachael Rowe to win the Roehampton GC Tournament. Chris played 9 exausting games on Sunday on the way to overall victory. There has been some hasty 'One Ball' training for Raghu Iyre this week before his exciting trip to his first 'outside' Tournament at Winchester on Saturday. Although a new comer to the AC game, Raghu finished 3rd in our qualification 'One Ball' Tournament 10 days ago, but goes forward to represent Phyllis Court in the National finals due to the unavailability of 1st & 2nd placed Mike Fensome & Heather Masheter. - Competition matches get under way with gusto! Eight players were quick out of ther blocks to play thier early competition matches on this, the first week of the season long competitions. The first three games to be played (and thus earning drinks from Chairman Chris) were Jill Hale's defeat of Joanna Iyer, Rosie Richardson's victory over Peggy Beeson, and John Hales' success against Ann Norman. Well done all of you for your promptness. in a sister National event and that one still wrankles with some at the London Club. with victories in all four of their singles rubbers but all was far from plain sailing. of the doubles and remaining singles by one hoop every time. In fact no less that 11 of the 17 games went to the final hoop! the crowd of one man (with no dog) was kept in suspense right until the end. We now await the winner of the Kenilworth v Watford tie to see who we will face in the National Quarter-Final. It was double delight for Phyllis Court Croquet with our AC team opening their League season with a sound win over the Students at Oxford University on Saturday. Captain Brian Bucknall, Peter Honey and Harry Midgley all won their matches and newcomer at this level, Michael Wiles ran his opponent as close as two hoops in the overall 3 - 1 win. The day before the former three players plus Elizabeth O'Dair had shared the spoils in a home friendly with the Roehampton Club. 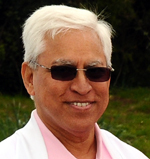 Raghu Iyer represented Phyllis Court at the Naational 'Pink' Charity One Ball Finals on Sunday and had a great time. experienced qualifiers from all over the country. over £ 3000 for the Breast Cancer Campaign. There was a familier story at both this week's tournaments when established players steered newcomers to first time victories. Christine Searl's smile just grew wider with each win as she and Don Rutherford (pictured far left) wrapped up the first of our Golf Croquet Drawn Partners Tournaments on Thursday. 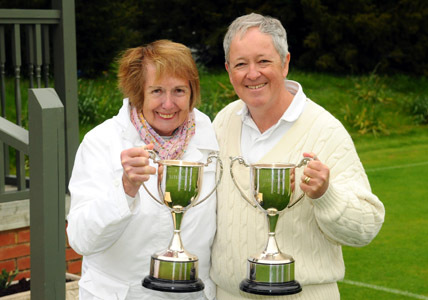 And then Margaret Broughton emerged as the 'high handicap winner' of the weekend Association 'Barnses Cups' event as Chris Roberts took the 'low handicap' cup. (picrured, near left). Phyllis Court on the evening of Tuesday 29th May. 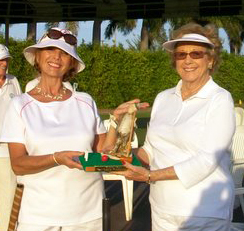 play their flagship croquet event at our Club. hopefully staying on for a post match supper with us afterwards. the 'Most Famous School in the World'. Our 'C' team got close but not close enough against High Wycombe today and let a half time 3 - 1 lead slip to a 5 - 7 reverse today. 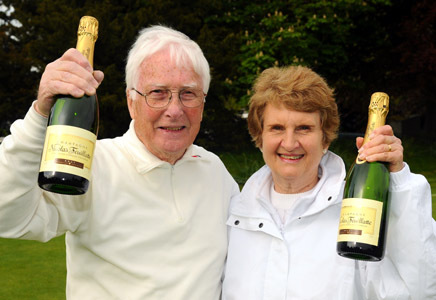 After the doubles pairings of Rosie Richardson & Ian Norris, and Hugh Crook & Anne Attfield had done well early on, PCC were found out in the singles and only Ian and Anne managed victories from the eight solo games. Next up is our 'B' team, who entertain Blewbury on Monday, starting at 1330 - spectators are very welcome as always. Knock-out wins for Hugh Crook and Sylvia Thomson saw them both reduce their handicap down to the '6' mark in the last 24 hours. Yesterday evening Hugh beat Rosemary Noel-Clarke and this afternoon, Sylvia saw off the very game Jill Hale. As the 27th May draws ever nearer, most of the matches have now either been played or are imminant - well done everone! Raymond's Wood's PCC 'B' came from behind, reversing a 1-3 half time score to a 7-5 victory to go Top of the Southern Fed. H'cap League. PCC 'B' lost only 2 to their 8 singles rubbers with top pics, Raymond Wood and Mike Fensome both conceding a hat-full of extra-turns. John Chalfont was the star of the day, winning one of his doubles ties and adding victories in both his singels. 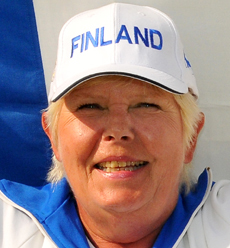 Mary Gaynor was not far behind in winning both her singles too. Phyllis Court hosted The Eton College House Croquet Championships today and how nice it was to have the boys and satff with us on a lovely sunny evening. 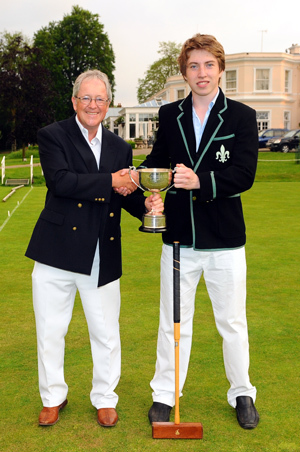 Ollie Myers won the croquet title for Penn House by a slim three hoop advantage over pre-match favorite Edgar von Ottenritter of Farrer House. The match was a tight affair, and Myers played a cagey game late on, sat on his +3 lead in the last minutes and so took home the silverware. Earlier in the evening, Myers had won the Doubles title too with partner Duncan Cornish in another very close match, winning by just two hoops over Ollie Sale and Jack Parham of College. But it was because of the singles runner-up von Ottenwritter that the competition had secure such a prestigious setting for it's final in the first place. 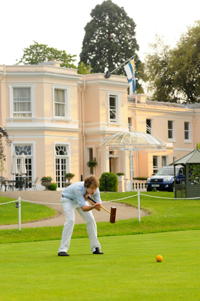 The young American had visited Phyllis Court last year as a hotel guest, precisely because of the croquet that was on offer at the Club. His enthusiasm was infectious and two Club members took him under their wing during his stay, and The Club were then delighted to offer their courts for the Eton finals. 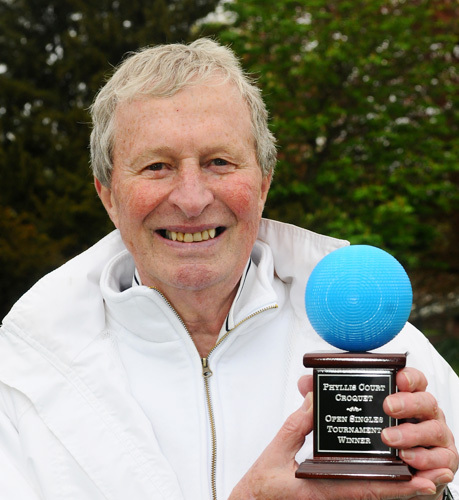 "Phyllis Court have been making quite a few waves in UK Croquet in the three or four years" reported Croquet Chairman Chris Roberts in a press release. 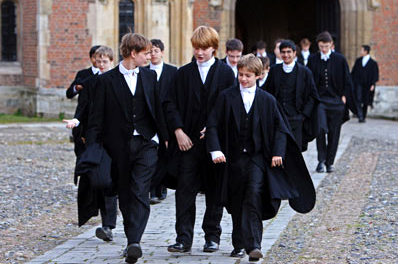 "And to have Eton College visit us is another feather in our cap as far as we are concerned. 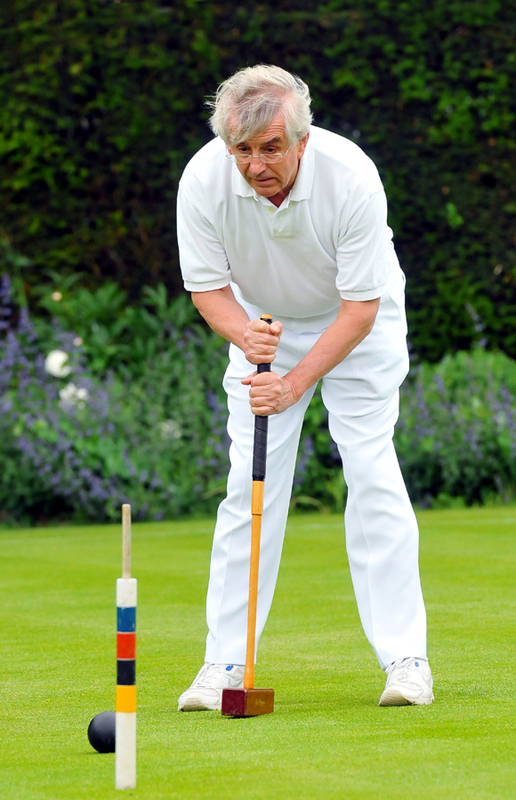 come our way, but we are very keen to promote croquet when ever we can"
"Once the word got round that our finals would be held at Phyllis Court, there was jockeying for selection like never before. "We are so pleased to be able to enjoy such wonderful lawns, lovely setting and hospitality". 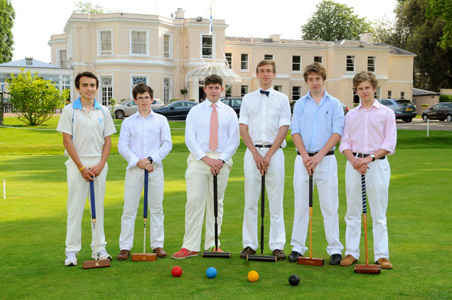 agreed that, with the event being such a success, the Eton finals will be returning to Phyllis Court next year. 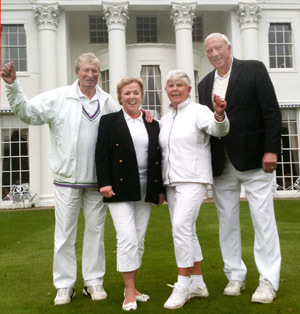 At Roehampton today, our AC team of Brian Bucknall, June Robinson, JT Johansen and Peter Honey were held to a draw at 3-3.